Six years ago, in the Timor Sea, one of the worst oil spills in Australian history occurred. Emily Mitchell says its well overdue for the Australian Government to provide justice to the people affected — our closest Indonesian neighbours. It was six years last Friday (21/8/15) since the Montara oil spill began spewing into the Timor Sea. Lasting 74 days, it was the worst oil spill in the history of the Australian offshore petroleum industry. While the full impact remains unknown to this day, the people who know most about its impacts are our closest Indonesian neighbours. They continue to call for justice. It is well overdue that the Australian Government heeded their calls. In 2009, in the closest Indonesian province to Australia, Nusa Tenggara Timur (East Nusa Tenggara), people scattered across hundreds of kilometres experienced a host of strange experiences. Within a week of the oil spill beginning, fishermen reported a "lake of milky oil" in their fishing grounds. Within a month, communities say oil was washing into their seaweed farms, which were completely destroyed within days. By November, communities hundreds of kilometres north of the spill reported that their seaweed farms were dying. Fishing nets were fouled with oil and fish catches dwindled completely. Seaweed farms, the income for thousands of people, perished almost instantaneously and fell to the ocean floor. People watched oil and dead fish wash up on their beaches. People developed itchy rashes on their skin. Some people developed food poisoning, requiring hospitalisation. Young people were taken out of education due to the spiralling poverty. “I tried to get out of it. but it was like it was chasing me." In 2010, the then Labor Government set up an inquiry that essentially had the same powers as a royal commission — the Montara Commission of Inquiry. It heavily critiqued both the polluting company, PTTEP Australasia, and the regulator, the Northern Territory Department of Resources, for failures in the lead up to the spill. But, despite such findings, there has never been further investigation or negotiation secured by the Australian Government to assess what a ‘significant degree’ looked like, or how far it had spread into Indonesian waters. The polluter, PTTEP Australasia, has previously asserted that scientific research suggests the oil never reached the Indonesian coast — a claim that is unsupportable based on eyewitness Indonesian accounts. In one village, eyewitnesses saw oil sweep across their beach, destroying mangroves which had been a vital wall protecting the village from the ocean. The village, which was set back more than a kilometre from the ocean, was subsequently flooded. Today, a 1.1 kilometre wall stands in the village that was funded by the villagers’ own savings and assistance from the government. It stands as concrete evidence that the "oil came through here". The difference in the response of the U.S. Government in relation to the 2010 Deepwater Horizon spill and that of the Australian government to claims of damage in Indonesia provides a stark contrast. Just last month, the U.S. government formed an agreement with BP for the oil company to pay US$18.7 billion to settle matters concerning the Deepwater Horizon spill, including fines under the Clean Water Act. In August 2010, BP was forced by President Barack Obama to make its first downpayment of $3 billion into an escrow account that eventually reached $20 billion in compensation. In stark contrast, the survivors in Indonesia of Australia’s 2009 Montara oil disaster have received nothing and PTTEP Australasia paid just $510,000 in fines for Montara. The Montara oil spill has to be the cheapest major oil spill in recent history. For more than two years, the Australian Lawyers Alliance has tried to raise awareness of what is a tragedy of significant concern and international significance. Since we began to investigate, we have faced the same messages from the same people. We have come up against a wall. Last month, the Australian Lawyers Alliance released a 259 page report that compiles our extensive research: 'After the Spill: Investigating Australia’s Montara oil disaster in Indonesia'. We have spoken with the media and politicians. We have sought out freedom of information applications. We have spoken with people who cried as they remembered the devastation wrought to their income. We have seen the beach where the mangroves died. We have seen the still-present disease on the seaweed farms. We have seen the strange rashes on people’s hands. We have met the children that were taken out of school as their families could no longer afford it. It is time for action. 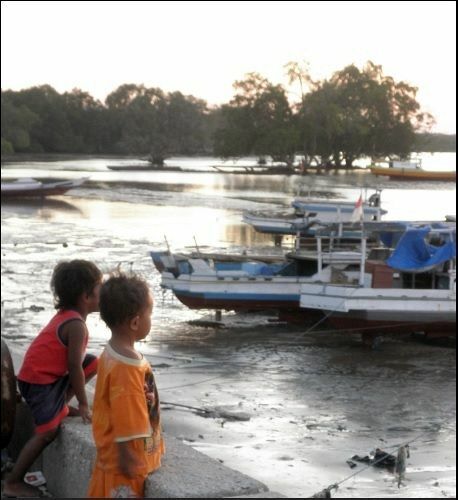 Before the spill, Nusa Tenggara Timur was already one of the poorest provinces in Indonesia. "The people are crying for their lives." After the spill, he provided rice to some villages for a year to ensure that they would not starve. His government has waived tax in some seaweed farming villages as they are still not earning enough money. It is entirely unjust that thousands of people in Indonesia have had to personally carry the burden of trying to earn an income in an environment that has been destroyed. It has been six years since the spill began and people are still seeking answers. They deserve them. Last year, the Indonesian Government appealed for assistance from Australia to resolve the issue. Nothing has been done. Before the 2013 election, Tony Abbott asserted that Australia’s relationship with Indonesia is "perhaps our most important relationship". But the closest Indonesian province to Australia continues to labour under billions of dollars in economic loss and Australia has done nothing. People’s homes, livelihoods and paradise were lost — and on Australia’s watch. It is time for Australia to step up and negotiate towards an appropriate investigation and a solution. Emily Mitchell is the Legal and Policy Officer at the Australian Lawyers Alliance and the author of ‘After the Spill: Investigating Australia’s Montara oil disaster in Indonesia’. Do the right thing. Subscribe to IA for just $5.